Today’s guest is Blayne Smith, a West Point graduate, US Army veteran, and executive director at Team Red, White and Blue. Team Red White and Blue is a a national organization with the mission of helping veterans and local communities connect and help each other through physical fitness activities, including running, Crossfit, and yoga. The team is comprised of approximately 40,000 members, located in over 100 communities across the globe, and is growing strong with approximately 500 new members each week. This interview will not only teach you about the organization but will also inspire you. Blayne shares how the organization is making a difference and speaks on his concepts of mindset, adversity, and something called the eagle ethos. Team RWB’s mission is to enrich the lives of America’s veterans by connecting them to their community through physical and social activity. Blayne served multiple tours in Iraq where he led a scout platoon, covering 300 square miles of lawless terrain between Baghdad and Fallujah. His unit conducted over 200 combat missions, captured insurgents on the Black List, uncovered weapons caches, and disrupted the bad guys enough to reduce rocket and mortar attacks in both cities. In 2009 Blayne redeployed to Afghanistan – this time as a special forces operator – and lead a detachment of the 3rd Special Forces group, taking the fight to the Taliban. In 2010, he left the military to return to Florida where he went into selling medical equipment. 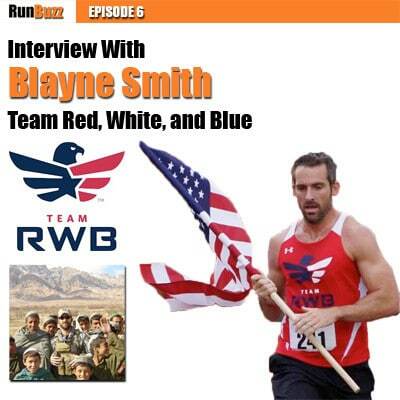 Blayne, along with many other veterans, turned to running which, ultimately, lead to forming this incredible organization with an amazing goal – Team Red, White and Blue not only aims to help veterans, but the civilian population as well. PaceBuilders® Training System – A complete, end to end, custom training program for runners. Get unlimited ‘customized’ training plans with unlimited modifications that match your lifestyle and running goals. PLUS, get access to video training sessions and unlimited support so you can blast through your running goals. Share RunBuzz running tips with your friends!